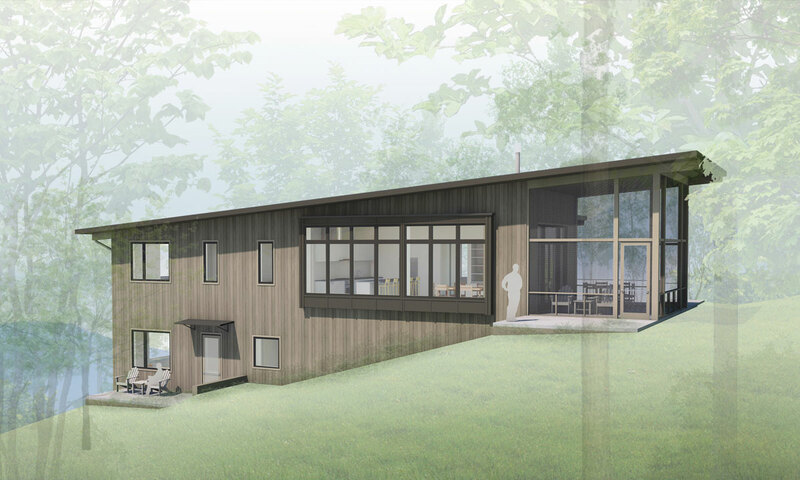 One of our newest projects is a simple, modern home located in Marshall, NC. Soon after our clients bought property in rural Madison County, they approached us to help them develop a master plan for the 12+ acres. Their vision was to create a simple home for themselves and rental cabins for artists and visitors. Our process began by studying the character of the land and developing a plan, which included a home site, outbuildings, an access road, and the future artist cabins/studios. After an initial site visit, it was clear that the house would be best located at the top of a large ridgetop meadow, looking out toward the distant mountain views to the south. Our clients, who are both multidisciplinary artists, were looking to fit a comprehensive program within a small footprint. The 2,600 square foot house features main level living and sleeping spaces and an art studio/music room and a stand-alone guest suite on the lower level, each with their own private entries. Situated at the edge of a forest and meadow, the general concept of the design is focused on the idea of “Refuge and Prospect.” The bedroom spaces serve as a place of protected refuge, while the living spaces have an outward looking prospect towards the meadow and mountain views. We drew inspiration for the exterior materials and form of the house from the vernacular of Appalachian farm structures – simple and utilitarian designs. Many of the design features were directly informed by the features of the site. The simple shed roof follows the slope of the ridge. The large cantilevered window wall brings in considerable natural light and serves as a place to sit or display plants and interesting art objects. When the double doors in the living room are open, the large screen porch extends the living area and provides a compelling connection to the surrounding landscape. The process of bringing our clients’ ideas into reality is a truly rewarding practice. We are excited to see this project break ground in the Fall!